Service was warm and efficient, and along with our server we had water service from someone else who I think was the sommelier (but I never asked). 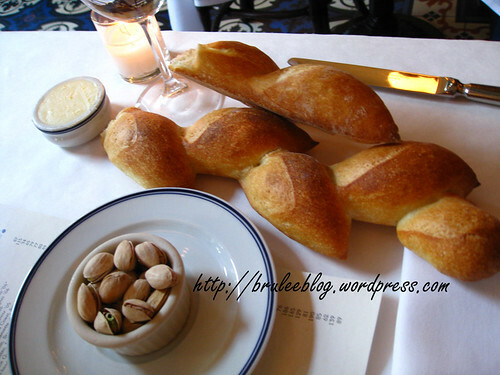 To start, we were served a long loaf of pain epi (bread formed to look like stalks of wheat) and a small container of warmed pistachios. The bread was tasty, but was more dense than what we had at L’atelier. 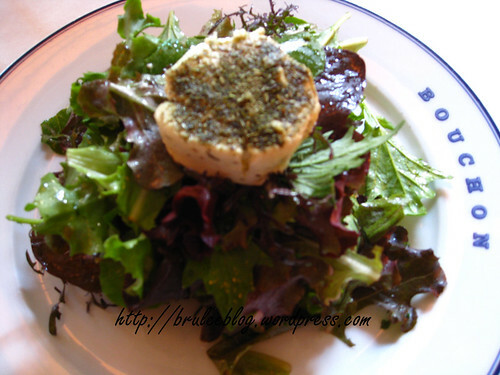 The warmed pistachios were a revelation, and they should be eaten like that all the time! 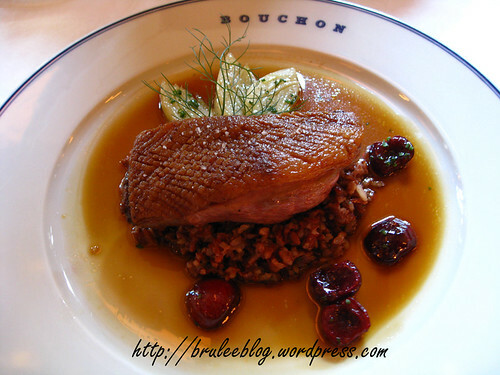 For mains, my companion chose the Canard au Riz Rouge – roasted duck breast with red rice, cherries, fennel and tarragon duck jus. I was tempted by many things on the menu but ultimately decided to order one of the day’s specials. 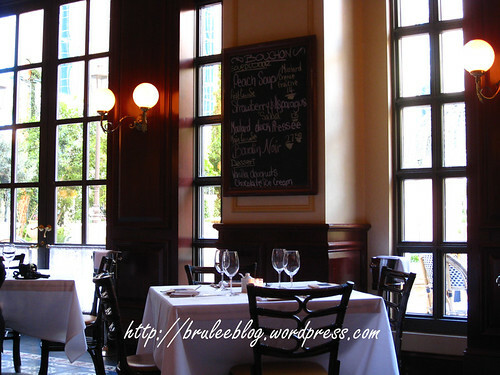 I’ve heard so many postive things about their Boudin Blanc, so imagine my pleasure when our server told me they were serving Boudin Noir that evening! 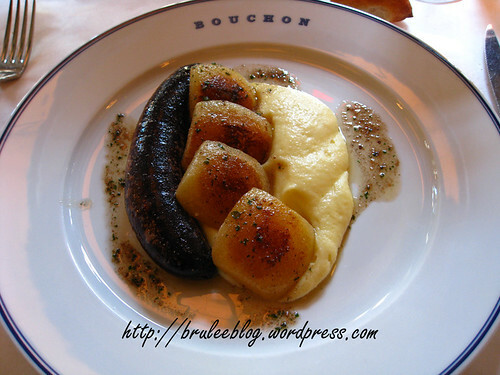 The Boudin Noir was blood sausage made by the same supplier that makes their Boudin Blanc, and served with caramelized apples and mashed potatoes. The mashed potatoes here were a little more rustic than the ones served at L’atelier; although smooth, you could still taste the texture of the potatoes and it fit quite well with the bistro food, so I didn’t mind the differing texture at all. Inside, the sausage was a deep, dark red and it tasted like it too. The apples were warm all the way through, slightly caramelized and slightly sweet. Both the apples and the mashed potatoes helped to tone down the richness of the sausage. This would be a fantasic meal to have on a cold day. 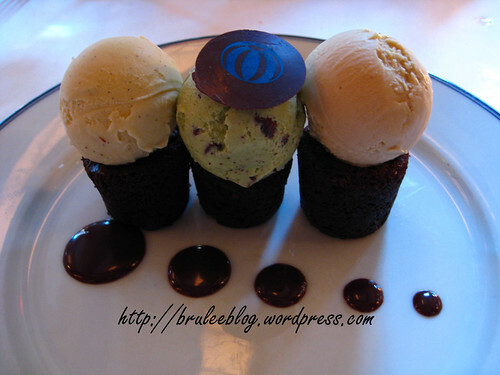 For dessert we had a trio of Bouchons with ice cream – chocolate caps (basically brownies) with vanilla bean and mint chocolate ice cream. There was a third flavour too, but for the life of me I cannot remember what it was, and I forgot to write it down. The ice cream and the bouchons were good, but I have to admit that they didn’t blow me away. Still, the plating was very cute! 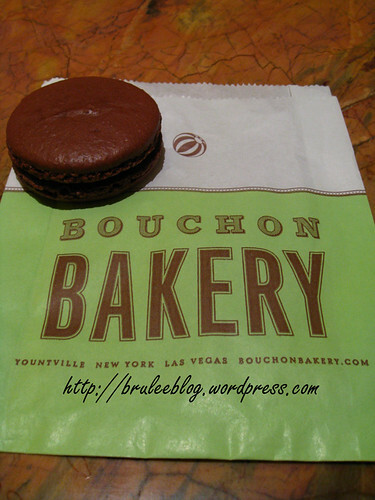 We had an early dinner and still had plenty of time before our late show (saw O at the Bellagio), so we wandered around the hotel and tried to find the Bouchon Bakery. Located on the main floor, just opposite of the theatre entrance (currently showing the Phantom of the Opera) and underneath the escalator, it can be very easy to miss. They had literally just started to close, so I quickly ordered a $3.50 chocolate macaron to nibble on later. Their macarons are giant versions of this very French cookie. Chocolate-y and soft on the inside, with a the thinnest crispy crust on the outside, they were just slightly sweet and I quickly became addicted to it. 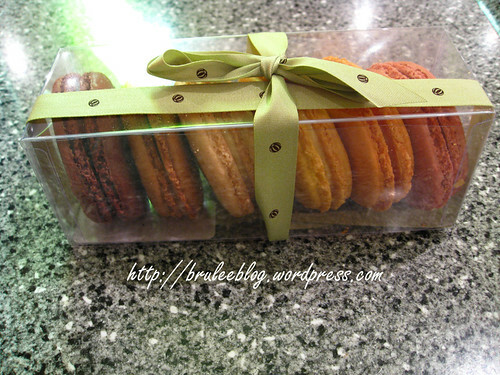 Granted, I have never tasted macarons before so I cannot compare them to other ones, but I quite enjoyed my pastry. And bonus – on my bakery receipt was a note saying that if you took the receipt up to the restaurant, you could get 15% off your bill. Darn! Wish I had known that before we had dinner! 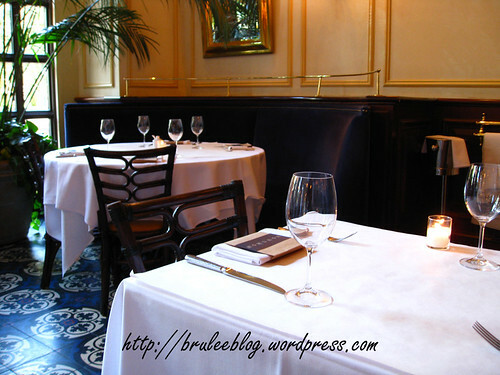 The next morning, we toyed with going back to Bouchon for their popular breakfast. 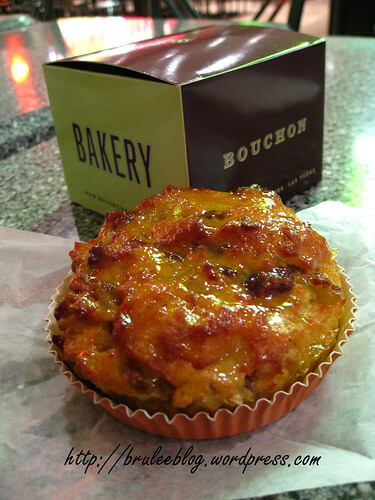 But, we slept in a bit and their breakfast ends at 10:30 a.m., so instead I settled on more goodies from the Bouchon Bakery. One package of assorted macarons, which cost $17.50 instead of $3.50 each. From left to right: chocolate, coffee, vanilla, lemon, orange, strawberry. I loved all of them. Even the coffee one, and I don’t like the taste of anything coffee other than Coffee Crisp chocolate bars. And their version of a bread pudding. Wonderfully moist and creamy. 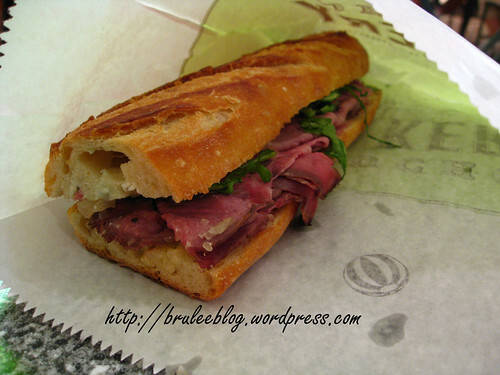 And lastly, since this food was serving as our brunch, we ordered a roast beef and arugula baguette sandwich, which was toasted in a press. A decent tasting, hearty sandwich. 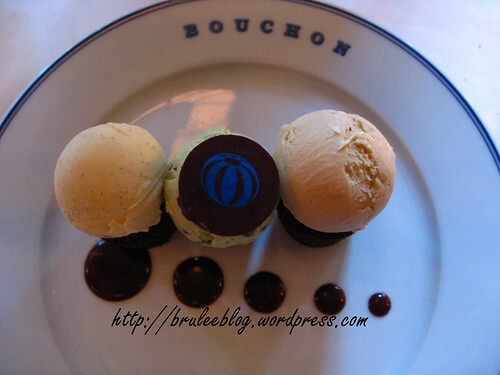 Every time we had a trade show at the Sands Convention centre, we would have lunch or dinner at Bouchon. Even if we had to sit at the bar. That Boudain Noir is fantastic.